Based on the stretched fuselage Bell 205, the Bell 212 was originally developed for the Canadian Forces (CF) under the designation CUH-1N Twin Huey. Later the CF adopted a new designation system and the aircraft was re-designated as the CH-135 Twin Huey. The CF approved the development of the aircraft on May 1, 1968 and purchased 50 aircraft, with deliveries commencing in May 1971. The US military came very close to not procuring the Twin Huey. The purchase of the aircraft for US military use was opposed by the Chairman of the House Armed Services Committee at the time, Mendal Rivers. Rivers took this position because the aircraft powerplant, the Pratt & Whitney Canada PT6T was produced in Canada. The Canadian government had not supported US involvement in Vietnam and had opposed US policies in southeast Asia, as well as accepting US draft dodgers. Rivers was also concerned that procurement of the engines would result in a negative trade deficit situation with Canada. Congress only approved the purchase when it was assured that a US source would be found for the PT6T engines. As a result the United States military services ordered 294 Bell 212s under the designation UH-1N, with deliveries commencing in 1970. Unlike in the Canadian Forces, in US service, the UH-1N retained the official name "Iroquois" from the single engined UH-1 variants, although US service personnel refer to the aircraft as a "Huey" or "Twin Huey". The Bell 412 is a further development of the Bell 212, the major difference being the composite four-blade main rotor. If this kit looks a bit familiar, then it should as I believe it is the Panda molding. 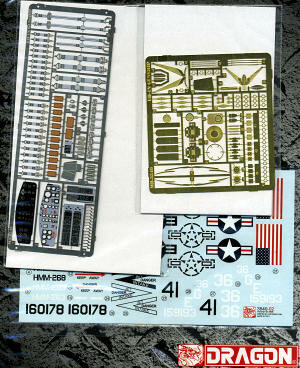 This kit has engraved panel lines and rivet detail as well. Some may think it a bit overdone, but much of this will be reduced by paint. 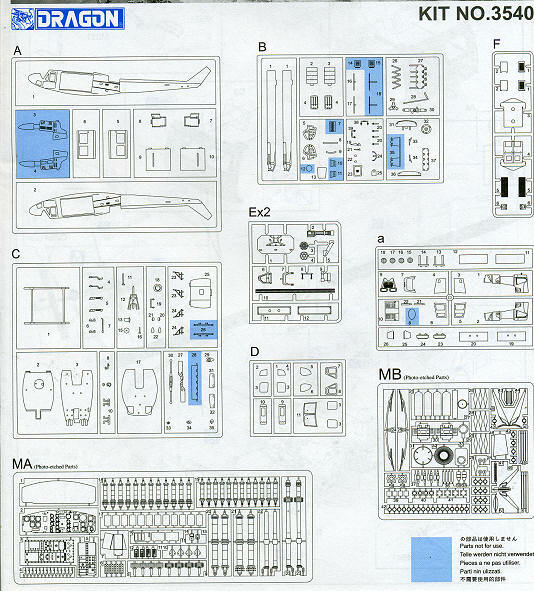 The base kit is not a complex one at all, though many have commented that it had the wrong instrument panel, being that of the Bell 205 instead. 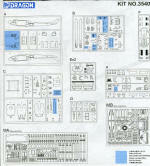 As a note, I've shown a few sprues as well as the parts layout from the instructions. Well, Dragon has taken care of that situation by providing two photo etch frets. One, with the instrument panel and belt detailing, is in full color and will provide hours of modeling enjoyment attaching all those belt bits!. The other fret is for a number of other detail bits from windscreen wipers to cable cutters, rudder pedal det ail, eyelets and other smallish bits. 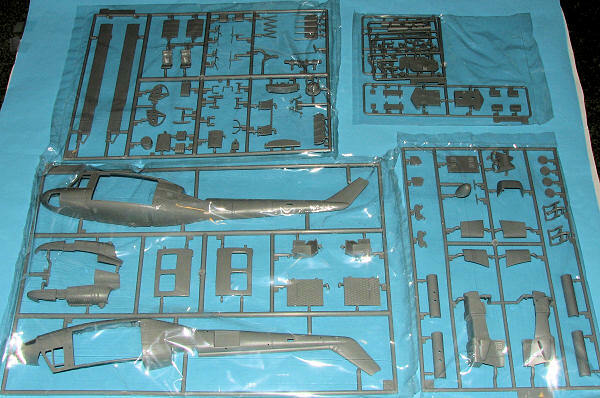 The kit includes additional sprues for the rocket pods and supports. Miniguns are also supplied for the aft cabin alcoves. Instructions are well done as usual for Dragon. There are 11 superbly drawn construction steps with detail drawings for various bits and pieces to be sure these are properly done. Gunze and Model Master paint references are provided. There are basically three different camouflage schemes provided and all three are shown on the box art. First here is the overall Olive Drab version with full color markings and the big yellow tail warning band. I believe this is supposed to be gloss OD. 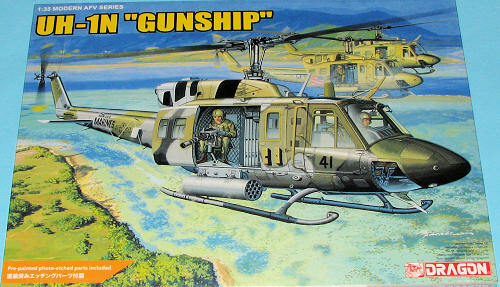 The artwork lists it as being from the USS Guam and HMM-263. Next is the most prominent one on the box in the three tone camouflage scheme as assigned to HMM-268 aboard the USS New Orleans. The final scheme is another overall OD, but matte in this case with low viz insignia with HML-367. Decals are well printed and I've generally had good results with Dragon markings. If you like helos and especially like big ones that can be used in your military dioramas, then this is a great one to get. It has a good basic kit with enough embellishments included to make a real stunner. 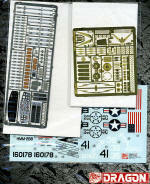 My thanks go to www.dragonmodelsusa.com for the preview kit. You can get this at your favorite shop, or on-line from the hyperlink.